After you have gotten your bike and your helmet, the next most important thing to get is the best bike pump possible. The problem with getting it, however, is that the market comes with many at various prices that may even overshadow some of the best on display. That said, it is not completely hard to get the best bicycle pump or even the best mini bike pump if you are able to look closely enough and consider a few very important points. The first and most important thing to check is the ability of the pump to deliver. It is important that it comes with adequate pressure. Its fit is another thing to consider, as you will prefer something that will be able to fit both Presta and Schrader valves. Also, you will need to decide what you need, whether is the normal size, a mini bicycle pump, or even a micro one. While you will mostly use the normal sized pump at home, you can have the micro bike pump strapped to your bike, and you can carry the mini either in your pocket or have it strapped as well, to your bike. The comfort of use, durability, cost, and perhaps, looks, are other things to consider when picking the best bicycle pump. We have objectively evaluated the most popular and the top recommended bike pumps using our knowledge of bikes, tyres and pumps; we also sampled opinions of users who had purchased and use these pumps before carefully selecting these as the best bike pumps. 1.4 kg / 3.09 lbs. 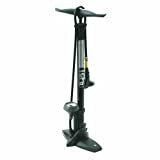 The Topeak Sport II Floor Pump is simply regarded by most people, including us, as the best bike pump. From its functionality to its quality and almost everything else about the pump, you get something that is better than most others that the market has to offer. One thing to appreciate with this is the way it was built as well as its multiple functionality and convenience of use for almost everyone. The pump comes with good and easy to use handle, long enough tube, and a dual head valve that allows for good locked down fit which is also enhanced by the lever. More so, it features a gauge that is not only very accurate but also easy to read, which is something you don’t get always with pumps. One more thing with the reading that most people find confusing is that even when the tires have air and they connect the pump, it still reads zero. You need to pump at least once before it starts to read. It can take you a max of 160 PSI. For the pumping proper, the Topeak Sport 2 does it in a good way because of the fact that it is ergonomically good and comfortable. It also has a solid base that keeps it well-grounded when you start. This the best bicycle pump you can lay your hands on at the moment because it does everything it should, just as it should. It is strong, very functional, and not expensive if you consider what it offers. The AerGun X-1000 is a very versatile and durable bike Pump which is designed with much precision and beauty. It is designed, to be almost the bike pump that you would get once and use in a lifetime. It has a beauty that immediately gets to you. Still, the strength of the piece is massive, with its quality build and great functionality. The pump comes with a versatile pump head that will serve you for both Presta and Schrader valves without needing any additional adapter or any needed complex adjustments. The pressure gauge it features is good and it takes a capacity of up to 160 PSI, which as normal, is enough for any bike you have out there. You also get accuracy with it, just as it is very easy to read. You will find the hose long enough to be convenient, and flexible enough and of great quality. The base and the handle are also solid, sturdy and comfortable to hold for a long time. It comes along with extras including balls and needles as well as a free ebook on bike tires. While it is one of the best bicycle pumps for some people, you can also use it to inflate balls, toys, strollers, inflatable beds and other objects. The hose could have been a little longer. Not the best for short valve. If your eyes are on versatility and every bells and whistle you can get from a pump, then this may as well be your best bike pump considering that it comes even with an eBook! The good news is that the extras are not just trying to hide anything under the sleeves because everything that has to do with functionality and quality is right on point. HIGH QUALITY PUMP HEAD MEANS A BETTER PUMP! The AerGun AerTight pump head is one of the Best Pump Heads available on any bicycle pump today. It is easy to use; requires no fiddling, switching or adapters; and has a convenient Pressure Release Valve to quickly and precisely remove air from tires to adjust for different types of training or riding (trail, road, etc...). The X-1000 lasts for years, so it is worth the extra money. Don't be fooled by pumps with lower quality pump heads. HIGH POWER, HIGH PRESSURE: You're going to love the superior performance of the X-1000! Easily fill bike tires up to 160 PSI (11 Bar). Feel its power in every stroke. PLUS: Ball and Bladder Needles included for: Fitness & Soccer balls, Basketballs, Footballs, Pool Toys and More. A very simple but functional and great looking one is the Serfas TCPG Bicycle Floor Pump. It combines good and long hose, with a good quality of build, and accurate gauging system, to stand out from the crowd. One of the best things you will come to find out with this is that it features a good valve that allows you to easily switch from one valve to the other. What this means is you can just flip it the other way and either use Schrader or Presta valves. The handle is very solid and comfortable while the base is made of sturdy nylon. These, coupled with the fact that it has a lever that is easy to lock, all make this bike pump very easy to use. With the gauge, it gets the job done mainly as it is clear to read and you can read off the tire pressure off it very easily. Nevertheless, it may not be the most accurate out there, and you will need to set a gauge you would want it to reach but like most others, this will gauge up to 160 PSI and it comes along with accessories such as ball inflators. Durable and with good quality. It comes with convenience and comfort thanks to the solid handle and base. The gauge reading is not the most accurate you will get. 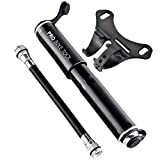 Considering ease of use, durability, and the ability to use on different valves, this may go as the best bike pump, or one of the very best and it doesn’t ask for too much money. If you are looking to get the best mini bicycle pump, the first place you can start looking is the Pro Bike Tool Mini which comes with affordability, compactness, and great functionality. Delivering a high pressure up to 120 PSI, this is a piece that will perform excellently well for you when you get stuck on the road or when you are mount riding. It has an excellent design and a durable build most especially with its aluminum body as well as good shaft and piston. Also, it features a strong and flexible hose that has both Presta and Schrader valves and is reversible. However, though it comes with a gauge that functions very well, it doesn’t give complete comfort when pumping. Nevertheless, this limitation is understandable because it is a mini piece that you can easily carry as you go on a ride because it is very compact and lightweight. This is a very good mini bicycle pump for both road and mountain bikes. It functions very well no matter your valve and it promises to last for almost forever. It gives high pumping performance and is one of those things you need to have as a serious biker. This micro floor bike pump comes great like most others on this list but before anything else, we must talk about the design of this miniature pump. It is very compact and sleek with a silver body that even adds more to the beauty. The handle like the body is made of aluminum and it has a simple “T” design that is neither too small nor too large to ruin its compactness. The base of the pump has a foot peg that can be folded. This will add to the stability of the pump when you are pumping. A very lightweight and easy pump, this is capable of producing 90 psi of pressurized air. It comes in two types, with the first (HVG) having a pressure gauge and the HV which only has a rubber hose with the purpose of reducing weight. Now back to the hose, it is not only flexible and durable, it is also long enough for most needs. For use on both Schrader and Presta valves, there is the ABS Flip-Thread Chuck that you just need to flip to any side you need. Good hose in length and quality. Best for long distant cycling. Not the cheapest in the market. Because of the size, the handle may not be the most comfortable. If you are a long distance or traveling rider, this will be the one that I will recommend for you. The micropump is one of the most convenient and portable bicycle pumps at the moment. Its completeness comes because it is durable, portable, convenient, and functional. HIGH PRESSURE - The Micro Drive HVG Pump delivers floor pump efficiency and volume in a super compact, hand pump size. Maximum psi for this pump is 90psi. The HVG Pump weighs 208g and is 300mm tall. PRO QUALITY MATERIALS - In each Micro Drive Pump, the barrel, piston, base, and T-handle is produced from lightweight aluminum using precise CNC machines and optimized for high pressure applications. At the end of the day, you will come to see that the best bike pump is not necessarily the one that will cost you your fortune. Instead, it is the one that will get the job done for you just when you need it to, and exactly how you need it completed. You would also realize that there are many pumps out there, making it hard to pick the right one but with the ones provided on this list, the job is almost all done for you.